Ibuprofen with NDC 46122-580 is a a human over the counter drug product labeled by Amerisource Bergen. The generic name of Ibuprofen is ibuprofen. The product's dosage form is capsule, liquid filled and is administered via oral form. FDA Application Number: ANDA078682 What is the FDA Application Number? 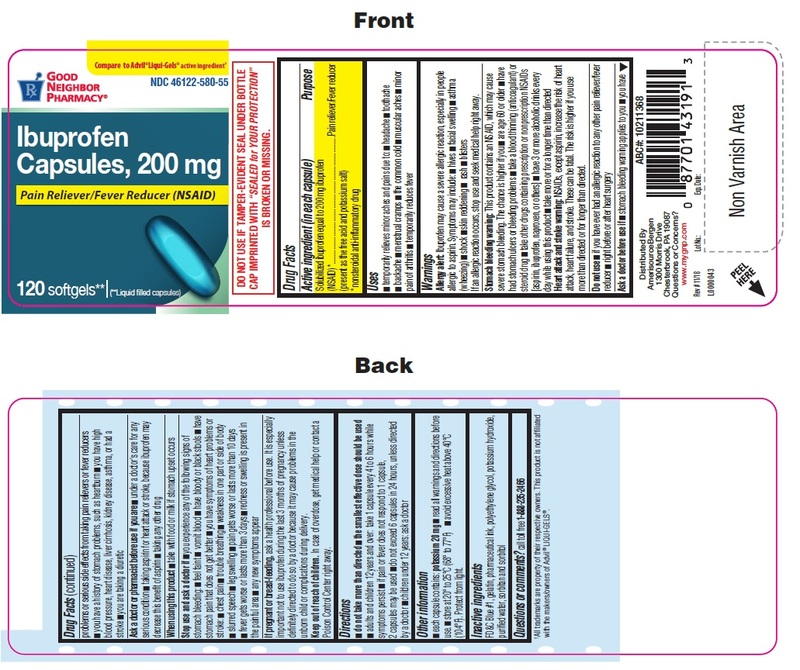 Allergy alert: Ibuprofen may cause a severe allergic reaction, especially in people allergic to aspirin. Symptoms may include:hivesfacial swellingasthma (wheezing)shockskin reddeningrashblistersIf an allergic reaction occurs, stop use and seek medical help right away.Stomach bleeding warning: This product contains an NSAID, which may cause severe stomach bleeding. The chance is higher if youare age 60 or olderhave had stomach ulcers or bleeding problemstake a blood thinning (anticoagulant) or steroid drugtake other drugs containing prescription or nonprescription NSAIDs [aspirin, ibuprofen, naproxen, or others]have 3 or more alcoholic drinks every day while using this producttake more or for a longer time than directedHeart attack and stroke warning: NSAIDs, except aspirin, increase the risk of heart attack, heart failure, and stroke. These can be be fatal. The risk is higher if you use more than directed or for longer than directed. Each capsule contains: potassium 20 mgread all warnings and directions before usestore at 20° to 25°C (68° to 77°F)avoid excessive heat above 40°C (104°F). Protect from light.